AND I only have one more Star Wars movie to watch before I've seen them all (thank goodness...they make me sleepy)! If you know me at all, you know that popcorn is my favorite food. We have a lovely popcorn machine in our lobby. I wish my desk was right next to it so I could just eat out of the bottom of the popper. Who needs a bag? It smells so good all day long. My balanced meals suffer because of said popcorn machine. WARNING: Don't put a popcorn machine in your office. I will show up at some point if you do. Happy Father's Day! A day to celebrate dads is important. My dad was able to come to Omaha tonight for dinner at Johnny's Italian Steakhouse. I also spent much of my afternoon baking a father's day treat for him: Coconut Cake. Happy Father's Day to all dads out there. Thanks for all you do! You can find this Paula Deen recipe at FoodNetwork.com. I saw a book at Anthropologie (where else?) and thought "That sounds like a good book." I know now that I was more likely subconsciously thinking "I need to read this book." A week or so later I found the book in a bargain bin at Borders, and just the title spoke to me and I had to purchase it. 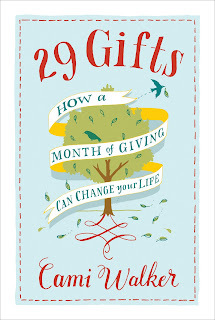 The book is 29 Gifts: How a Month of Giving Can Change Your Life by Cami Walker ( a native Nebraskan, I later found out). After being diagnosed with multiple sclerosis, Cami learns how to "live in abundance" by giving 29 gifts away in 29 days. They don't have to be material things, a good thought or kind word counts just as much. "A wise mentor once told me to be mindful of the stories I tell over and over because they are indicative of the thought patterns and beliefs that limit me." How many times have I said, to myself or to others, "Well, I'm a perfectionist and I often demand perfection from others, even though that isn't realistic." I can't TELL you how many times I've said that. Over and over and over. I'm thinking that this statement is indicative of a limiting thought pattern and belief. I'm not particularly sure of how to remedy it right now, but I'm guessing that recognizing it as such will help. I don't know if saying it helps me deal with things when they don't go according to plan, or to help me remember that everyone isn't perfect or what. I just know that I say it a lot. You can learn more about Cami Walker and the 29 Gifts challenge at her website 29gifts.org. You can even commit to the 29 gifts challenge and give away your own gifts for 29 days. After poking around on her website, they also have a boutique with some of the proceeds going to the National MS Society. Some of my favorite items in the shop say "I am a gift" or "You are a gift". I really appreciate the reminder. Take the time today to be grateful for what you have, both physically, mentally and spiritually. I know I'm thinking a lot more about what I can give to others instead of focusing on me. Happy Friday and have a great weekend! "We do not remember days...we remember moments."